Bhambri could not assert himself despite being in an advantageous position in the third and final set. 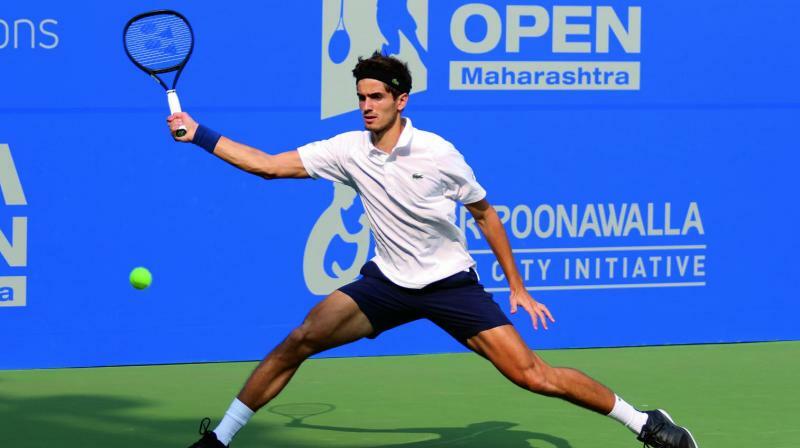 France’s Pierre-Hugues Herbert in action against Yuki Bhambri in their Tata Open Maharashtra second round match at the Mhalunge Balewadi Stadium in Pune on Wednesday. Herbert won 4-6, 6-3, 6-4. Pune: Ramkumar Ramanathan and Yuki Bhambri crashed out of the Tata Open Maharashtra tennis tournament here on Wednesday, following contrasting defeats in their second round matches. Bhambri squandered six break points in the deciding set, losing 6-4, 3-6, 4-6 to eighth seed Pierre-Hugues Herbert of France at the hard court ATP 250 event. Later, Ramanathan failed to get the better of his experienced opponent and tournament favourite Marin Cilic of Crotia, going down 4-6, 3-6. The entertaining encounter saw the top seed Croatian giant sail into the quarter-finals. Bhambri, ranked 118, needed to balance his game against a rival like Herbert but failed. Not only his first serve let him down, his second serve too didn’t have any sting, making it easier for Herbert to attack. Herbert’s game improved after a shaky start. He soaked in the pressure and attacked Bhambri. Displaying a positive body language after losing the first set, Herbert upped the pressure on Bhambri in the second set. In the second game of the decider, Herbert was down 0-40 but the Indian, with the confidence of winning 11 straight matches on these courts, could not take advantage of the situation. Herbert served big and his returns were strong, forcing Bhambri to scamper towards both sides of the court. The tactic worked as Bhambri squandered six break points, after which his shoulders dropped and he displayed negative body language. Herbert closed out the match with an ace. While the Frenchman used his service as a big weapon, firing 13 aces, Bhambri’s first serve deserted him, managing only 57 per cent accuracy on it.